This Annin Tough-Tex American Flag with Embroidered Stars & Sewn Stripes flag is so durable it has tough right in its name! The Tough-Tex flag is specially engineered for long-lasting, daily commercial and industrial use and is ideal for areas of extreme climate or high wind. The key to the Tough-Tex material is its heavy-duty, double-ply, 100% heavyweight spun polyester. The fabric features a special weave to promote flight. Its bright colors resist fading even against strong sunlight and intense ultraviolet radiation. 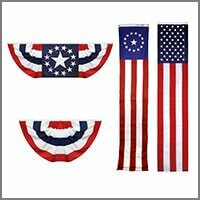 This flag also features embroidered stars, sewn stripes, a double-sewn fly end, and durable white canvas heading with brass grommets. This American flag is proudly made in the USA. 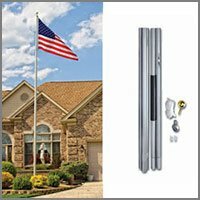 The standard home size for a flag is 3 ft. x 5 ft.
Annin's Tangle Free Spinning Pole Kit with Flag and Solar Light is a great gift item for newlyweds, new neighbors, new citizens, or for friends and family with a patriotic heart. 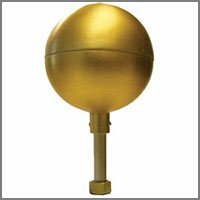 A white tangle free spinning pole with gold ball ornament. The two piece pole is 1 in diameter and 6 ft. long. 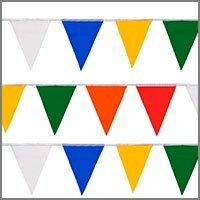 A white 2 way bracket to present your flag at a 90 degree or 45 degree angle. An Annin 3 ft. x 5 ft. nylon American flag. The flag features sewn stripes and embroidered stars. All you need in one kit. Our tangle free spinning pole insures your flag will not tangle around the pole in high-wind areas. Recommended for residential use only. See below for related products. Size: 6 ft. x 1 in. 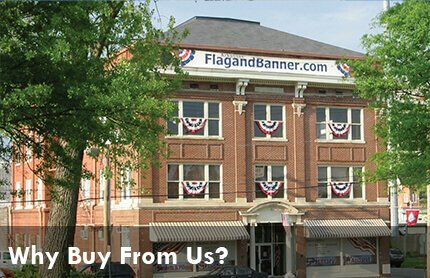 FlagandBanner.com is a 40-year veteran of the flag business. Started by Kerry McCoy during the recession of 1974 with only $400, Flag and Banner has become one of the nation’s best known flag companies. We have21 great reasons why you should buy from us, but one of the best is that we will provide you with genuine courteous customer service. Twice a year we call to check on your flags to see if they need repair or replacing, we offer in house repair services and if your flag cannot be repaired, we will retire it for you and send you a coupon for $5 off a new flag! We can answer any flag question you have from etiquette questions to what size flag should fly from your particular size pole and much more. We offer custom design services and local installation services. Our Little Rock showroom is open to the public six days a week. You always get to talk to a real person when you call. We are well known for our Quality Products – Expert Service – Outrageous Support. When you buy from us, you know we will be there to support you a year from now or 10 years from now. No other flag company in America can say all that! We are the only flag company with our own FREE magazine for our customers. Brave Magazine, published by FlagandBanner.com and paid for by advertisers gives our customers just a little bit extra. Brave Magazine features articles that exemplify the human virtue of bravery. Every person has a story of bravery. Sometimes we may not recognize it in ourselves, but everyday thousands of people across America are brave for one reason or another. Our purpose at Brave Magazine is to showcase that courage. We also include other articles such as current events, food, American hero, fun with flags and a "how-to" article usually about business. We hope that Brave Magazine will inspire you to celebrate your own bravery and challenge you to recognize it in others. 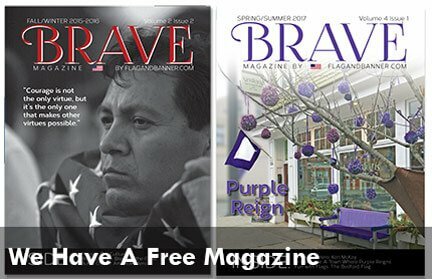 Click here to learn more about Brave Magazine or see our latest issue. 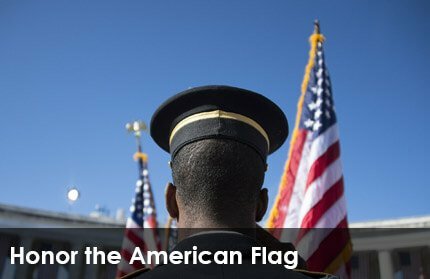 FlagandBanner.com offers a variety of services to help you honor your flag. Sign up for Flag Alerts to receive notices when your flag should be lowered to half staff, updated yearly calendars of flag flying holidays and exclusive deals and discounts all sent directly to your email inbox! 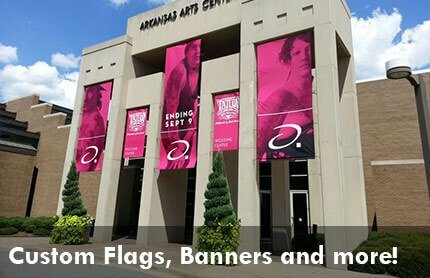 Flag and Banner is your one-stop shop for all things flag and banner. We can repair your flag, teach you how to lengthen the life of your flag and guide you when choosing the best way to display your flag. Give us a call at (800) 445-0653 and speak with one of our Flag Experts. 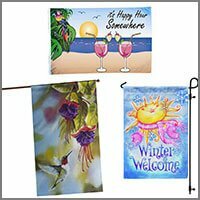 With over 40 years experience, FlagandBanner.com is one of America's most innovative producers of high quality, environmental graphics and soft signage. We can execute even the most complex, mixed-media designs using virtually any combination of materials, and we are one of the few companies that can create banners at competitive prices in-house AND fast! Our production facility also gives us the flexibility to do any job, large or small. From custom logo flags to directional signage to trade show displays, we do it all. Get a FREE Custom Quote for your project online right now. For more information on custom printed banners call one of our Creative Consultants at 1.800.445.0653 or email us at sales@FlagAndBanner.com for help. Make FlagandBanner.com your encyclopedia for any flag query. Use our FAQ at the top of every page to clarify how to hang a flag in your office, school or business. 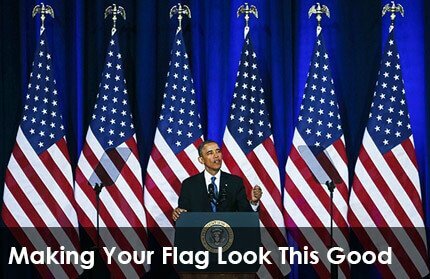 And we let you in on a little secret on how to make your flag look it's best. Hint: They are using our Flag Spreaders to make the flags "stand at attention!" View our video on how to properly use Flag Spreaders! P.S. These are our flags proudly displayed in the photograph above. We have other documents too: When to Fly the American Flag, Flag Etiquette, American Flag History, and more. 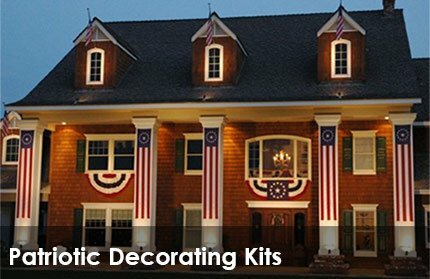 We offer pre-made Patriotic Decorating Kits for your home, office, boat, patio, gazebo, etc. in cotton, nylon, and tea-stained fabrics. See our great suggestions for decorating ideas! 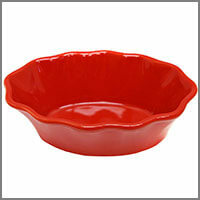 We also have patriotic apparel, kitchen supplies, home, garden, yard decorations and more! We want your event preparation to be as easy as possible, so you can spend more time enjoying the festivities, and less time worrying. See our American Patriotic Decorations for examples and ideas. Dr. Kris Shewmake was born in Pine Bluff, Arkansas. 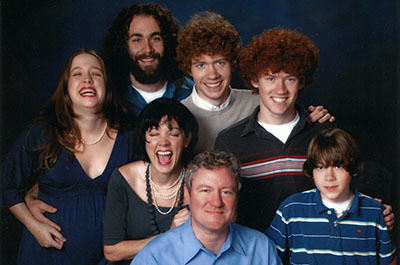 He earned his bachelor’s degree in biology from Hendrix College in Conway and a master’s degree in natural science from the University of Arkansas at Fayetteville. He received his medical degree from UAMS, where he also completed a residency in general surgery. He was president of his class and elected into the Alpha Omega Alpha Medical Honor Society (top 10% of the class). 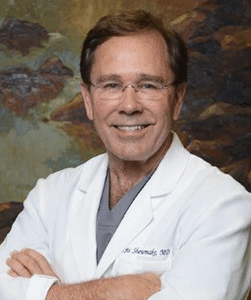 His eight years of surgical training after medical school included a General Surgery residency at the University of Arkansas for Medical Sciences (UAMS) Medical Center and a Plastic and Reconstructive Surgery residency in Dallas at the University of Texas-Southwestern Medical Center.